I don’t know about you, but I’m madly in love with succulents these days. The only problem is that my house doesn’t have a lot of light due to lots of trees and deep eaves. That low light issue has always made it hard to have plants indoors. 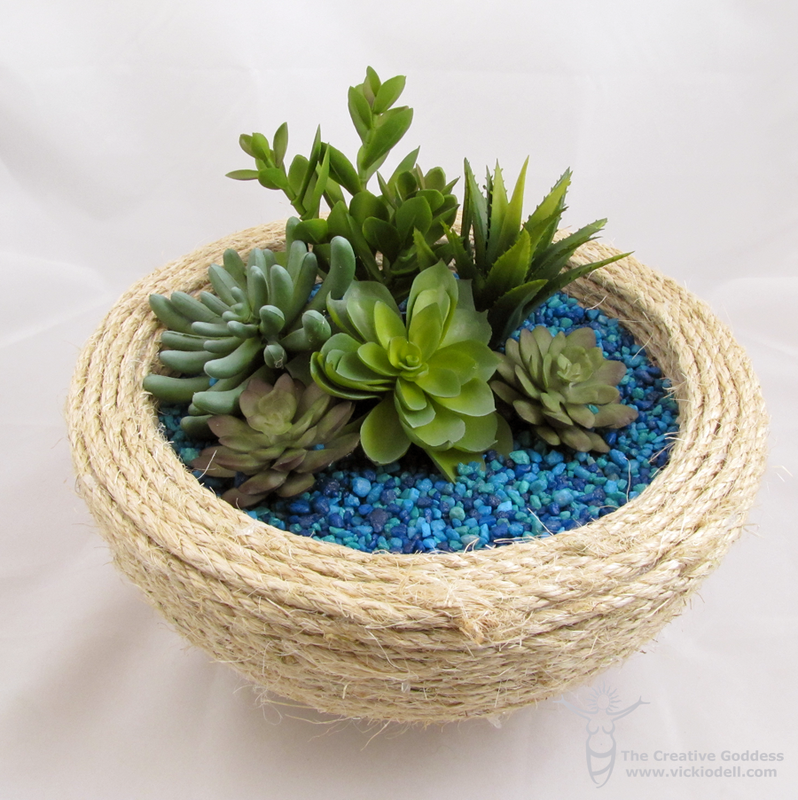 But I’ve found a way to add succulents without killing them with this Faux Succulent Garden Bowl. This DIY succulent bowl is an easy way to add a little green to darker interiors! 1. Use the hot wire cutting tool to remove a small amount of the bottom of the hollow ball so that the bowl will sit flat. 2. 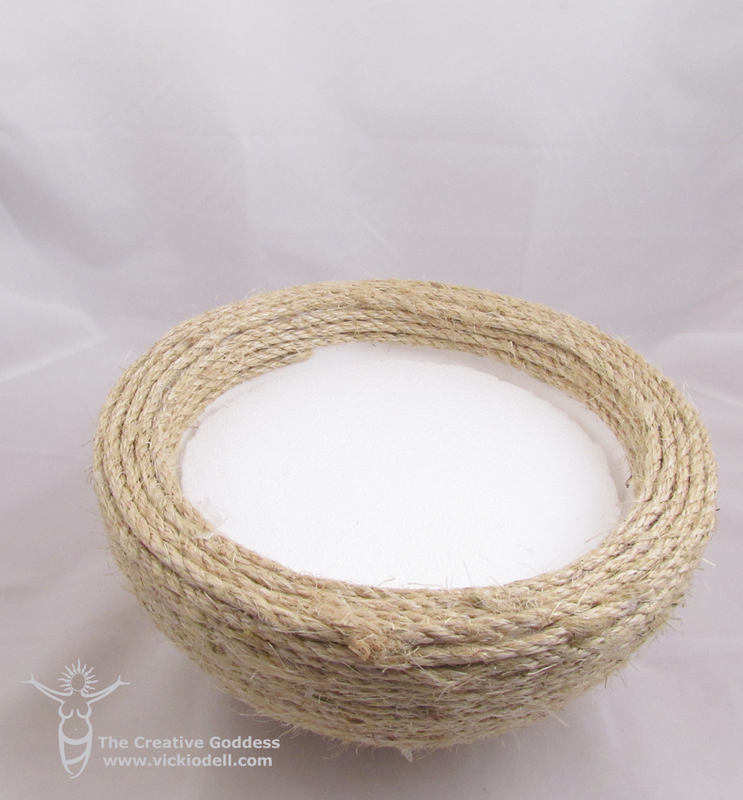 To cover the hollow half ball in jute rope, begin about 2″ down inside the bowl and glue one end in place. 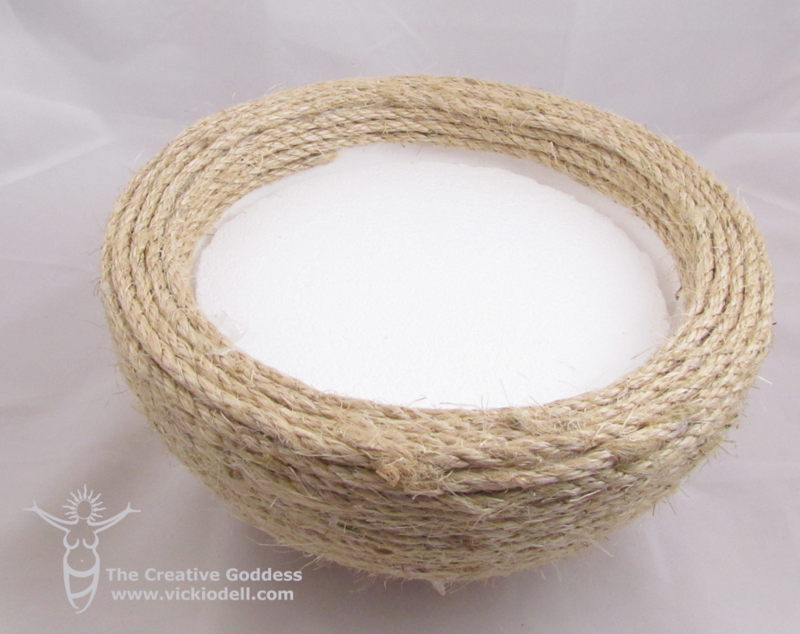 Wrap the bowl in a spiral pattern up to the rim, over the rim, and then down to the bottom. 3. Place the disc inside the bowl and glue it in place. You may have to cut it if it won’t fit down inside the bowl. 4. Arrange the succulents in a pleasing manner and glue in place. 5. Add aquarium gravel just to cover the disc and any bit of the inside of the bowl that shows. This entry was posted in Home Décor Crafts and tagged Ball, Disc, Display, Garden, Green, Tabletop by Vicki O'Dell. Bookmark the permalink. You know me as "The Creative Goddess." I am a floral designer, interior designer, craft designer, trend reporter, creative business consultant, writer and blogger.